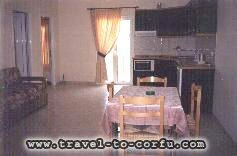 Our apartments are located in Agios Gordis, one of the most beautiful and quiet places on Corfu island. Our apartments for two to four persons have a fully equipped kitchen, shower / wc, double - glass windows, air - conditioning and balconies all around. Moreover, everything you need such as supermarkets, tourist shops etc is very close by. The distance between the apartments and the beach is only 300 meters. You will enjoy your holidays at Rolandos Apartments.